A town is held in the grip of terror by tales of a mysterious woman who calls men by their name and then abducts them, leaving only their clothes behind. 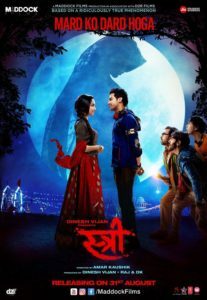 The plot is based on the Indian folk legend about a female spirit who attacks men at night if they are alone and only leaves their clothes behind. Rajkummar Rao was excellent as Vicky. 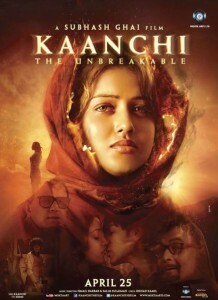 Shraddha Kapoor was good as the mysterious girl. Pankaj Tripathi was excellent as Rudra. Aparshakti Khurana was very good as Bittu. Abhishek Banerjee was excellent as Jaana. Vijay Raaz was ok as Shastri. Atul Srivastava was good as Vicky’s father. Hilarious movie. Loved it. Its a horror comedy but more of a comedy. The ending did not really make sense with respect to Shraddha’s character. The dialogues by Sumit Arora were fantastic. Some of the dialogues took clever potshots at politics. 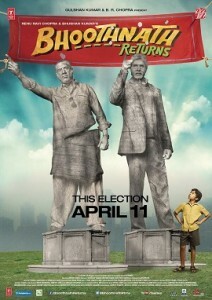 Story and screenplay was by Raj Nidmoru and Krishna DK is very good. Direction by Amar Kaushik was excellent. Its definitely one of the best movies of the year 2018.